Both traditionalists and annihilationists often say that their view of hell best accords with the manner in which Jesus suffered the penalty of sin in our place. I am still not convinced, however, that either understanding of hell has a significant advantage in this regard. Traditionalists generally focus on hell as an endless experience of the righteous wrath of God. Some understand the biblical descriptions (fire, darkness, physical agony, death) more literally than others do, but all necessarily give a metaphorical sense to “death,” since they believe that the resurrected dead live endlessly and consciously under the wrath of God. Most traditionalists emphasize separation from God in his grace as the key feature of the penalty for sin, as in Mt 7:23: “I never knew you; go away from me, you evildoers.” God is with the occupants of hell but only in wrath. Among believers in penal substitutionary atonement, however, whether they be traditionalists or annihilationists, it is common to hear it said that the nature of Jesus’ atoning death best portrays the nature of the punishment which those who persistently reject God will experience. I appear to have a blind spot right here, because it seems to me that, regardless of one’s understanding of hell, it is difficult to explain just how it was that Jesus suffered precisely that experience vicariously, on the cross and during his days in the grave. The traditionalist struggles to explain how Jesus experienced fully, within three days, what unrepentant sinners experience forever and ever. Yet it is the endlessness of conscious suffering that is most important to the traditional portrait of hell. On the other hand, the annihilationist is faced with the difficulty that the crucifixion and death of Jesus did not literally destroy him in body and soul. His death looks much more like the intermediate state as it is portrayed by substance dualists, in which a person’s body is completely lifeless but the person lives on until reunited with the resurrected body. If hell is annihilation, then how did Jesus experience it? Q: Why was it necessary for Christ, the Redeemer to die? A: Since death is the punishment for sin, Christ died willingly in our place to deliver us from the power and penalty of sin and bring us back to God. By his substitutionary atoning death, he alone redeems us from hell and gains for us forgiveness of sin, righteousness, and everlasting life. This looks to me like an answer which could be equally well offered by evangelicals of both positions, and this is the genius of the statement. Both traditionalists and annihilationists believe that “death is the punishment for sin” (cf. Gen 2:17; Rom 6:23) but the latter interpret “death” literally, and the former interpret it metaphorically. Having been raised and educated under constently traditionalist teaching, I do not find it difficult to see things through traditionalist eyes. I can conceptualize death as the punishment for sin, and Jesus’ death as a bearing of that penalty, which therefore delivers those in him from the second death. But I would not attempt to demonstrate that what Jesus experienced in his death was exactly the experience of those who reject God’s grace. What my pondering of the statement in the Catechism led me to consider, however, was how the death of Jesus would look if annihilationism were true, and I figured I might as well think some of those thoughts aloud. Here is a preliminary shot at atonement theology in annihilationist perspective. One of the first things that struck me is the importance of including in our understanding of Christ’s atoning work both his death and his resurrection. Romans 4:25 comes most quickly to mind: Jesus “was handed over to death for our trespasses and was raised for our justification” (NRSV). Had Jesus died but not risen from the dead, we would be the most miserable people on earth, as Paul said (1 Cor 15:12-19), because it was in rising from the dead that Jesus overcame death and demonstrated that, having suffered the penalty for sin, he was freed from its hold, so that we who believe in him die with him, and we will surely be raised with him to the new life which comes to all whose sin God forgives on account of Christ’s work, when it is appropriated through faith. The New City Catechism speaks to this in its answer to question 23 (“Why must the Redeemer be truly God?”): Jesus was “able to bear the righteous anger of God against sin and yet overcome death.” It is here that annihilationists are most puzzled with the proposal that the wicked are raised to live endlessly, under the wrath of God, so that the “second death” turns out to be an endless life, though traditionalists are quick to assert that what the wicked experience in hell is not really “life,” or “immortality,” not what God gives to those who are raised “with Christ.” From the annihilationist perspective, it is all quite straightforward and simple. The second death is analogous to the first, except that it is more complete, because it entails not just a destruction of the body but also of the soul, as Jesus warned in Mt 10:28. Everyone is raised, but only those who died with Christ participate in the fruit of his resurrection; only they are given eternal life, immortality and incorruption. In a blog post on April 21, 2011, Angie Cheatham summed up Adrian Warnock’s exposition of the statement that Christ was “raised for our justification,” and it is worth repeating here. 1. Raised to Give Us a Future Resurrection: Because of Jesus’ resurrection, one day our physical bodies will also return to life. 2. Raised to Prompt Faith in Us: It is the good news of Jesus’ resurrection, following his sin-defeating death, that will inspire us to believe in, trust, obey, and worship this man who lived two thousand years ago in a small country in the Middle East. Justification is “by grace . . . through faith” (Ephesians 2:8), and our faith itself requires the resurrection of Jesus. Unless Jesus had defeated death, we could never have the faith in him that is necessary for our justification. Jesus’ resurrection is in this sense the source of the faith that is the grounds of our justification: “If you confess with your mouth that Jesus is Lord and believe in your heart that God raised him from the dead, you will be saved” (Romans 10:9). 3. 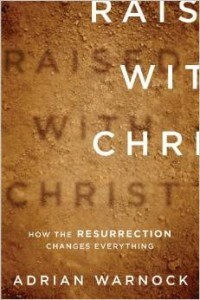 Raised for His Own Justification: It may sound strange to talk about Jesus’ need for justification. But justification is a declaration, a vindication. The resurrection of Jesus has evidencing power. Jesus is declared to still be righteous by his resurrection, just as he was declared to have become sin by his death. God’s wrath has been satisfied. 4. Justified So We Can be Justified: Despite our usual understanding that the cross alone is responsible for our forgiveness, Paul is elsewhere very clear. “If Christ has not been raised, your faith is futile and you are still in your sins” (1 Corinthians 15:17). We share in the justification of Jesus. Because of his right standing with God, his people are made righteous too. 5. Raised So He Can Apply Justification to Us: Faith is putting our trust in the person Jesus and in the fact that he died and rose again for us. How does Jesus apply salvation to us? Jesus himself saves us in the present. Edwards comments on Romans 4:25, “That is, delivered for our offenses, and raised again that he might see to the application of his sufferings to our justification, and that he might plead them for our justifying.” Jesus is before the throne of God pleading for us, no doubt on the grounds of his death and resurrection. “Who is to condemn? Christ Jesus is the one who died—more than that, who was raised—who is at the right hand of God, who indeed is interceding for us” (Romans 8:34). When Jesus was raised from the dead, he was victorious over death and he took the sting out of it (1 Cor 15:55) for all who die with/in him. Those who rise with Christ (and only they) rise to a new order of life, life as God intended it when he created Adam and Eve, but the life which they forfeited because of their sin and which all of us lost with them (Rom 5:12). But for those who die apart from Christ, resurrection has a very different significance. They rise to face God’s judgment, but they have not been raised to this life with God in Christ, and so, for them, there is no justification, only condemnation (cf., Dan 12:2; Jn 5:28, 29). This time, in the case of those who experience “the resurrection of condemnation” (Jn 5:29), what lies ahead of them is the “second death” (Rev 2:11; 20:6, 14; 21:8); they experience the wrath of God unmitigated by the grace that even the worst of sinners experiences in this life, and that wrath eventually consumes and destroys them. In summary then, it seems to me that Jesus’ experience of God’s righteous judgment upon human sin must be understood analogously, because we cannot demonstrate that it is exactly what the unrepentant wicked will experience, whether that is endless conscious torment or destruction by the wrath of God. In short, whether the traditionalist or the annihilationist account of hell is correct cannot be determined by analysis of what Jesus experienced as the “lamb of God who takes away the sin of the world” (Jn 1:29). We must examine more directly what Scripture says about the destiny of those who persistently suppress God’s truth in unrighteousness and refuse to submit to his rule in their lives. It appears to me, however, that the annihilationist way of describing the fate of the wicked, in light of what Christ did as sin bearer, redeemer, and victor over sin, death and the devil, is a more natural way to understand Scripture than is the traditionalist way. Unless one has reason to believe that human souls are intrinsically indestructible, it seems unlikely that a person who reads Scripture without prior knowledge of the alternative proposals would arrive at the conclusion that God subjects unbelievers to endless (eternal) conscious suffering. What we can all proclaim together as an essential of the gospel, however, is that, whatever Scripture says will be the destiny of unredeemed sinners, the only reason that any sinners are redeemed is that Jesus delivered all who trust in him by satisfying God’s just demands on their behalf. “Christ died willingly in our place to deliver us from the power and penalty of sin and bring us back to God” (New City Catechism, Q 24). In proclaiming the whole truth of Scripture, we must not be silent about the consequences of suppressing God’s truth, disobeying what we believe to be morally right (which is God’s law as we understand it), and rejecting God’s gracious overtures toward us. But we must not try to scare people into heaven. Our mission is to be ambassadors for Christ and ministers of reconciliation, declaring that God was in Christ, reconciling the world to himself, and entreating people to be reconciled to God because, “for our sake,” God “made him to be sin who knew no sin, so that in him we might become the righteousness of God” (2 Cor 5:18-21).We must all honestly warn people, as opportunity arises, that if they are now rejecting Jesus they are condemned (Jn 3:16-18), and that they will be justly sentenced when God judges the world (Acts 17:31). But primarily we should be known as the people who announce joyously that everyone who believes in Jesus will not perish but will have eternal life (Jn 3:16-18). This entry was posted in Christology, Eschatology and tagged annihilationism, atonement, death, hell, resurrection, traditionalism. Bookmark the permalink. This is, again, the problem with the name “annihilationism” — it leads people to think that we believe that “the wages of sin is utter destruction in body and soul”. This is not what we believe; it would simply contradict the Bible _unless_ death were defined as utter annihilation in body and soul, which is a strange definition. We believe that the punishment for sin is _death_, something all of us have seen. Christ experienced that. The natural result of death is corruption which leads to complete destruction of the person, but Christ is specifically said to not experience that (Acts 2, obviously). Why does His death look like that to you? I don’t see that portrayed anywhere in the Bible, although I know some people now interpret the famous “He descended unto the dead” of the Apostles’ Creed that way. I believe that Christ was actually held by the cords of death until those cords were loosed. That’s actually _why_ His body was raised — so that the cords of death would no longer hold His person. Annihilation isn’t the wages of sin, so Christ didn’t have to pay it in order to substitute for us in the wages of sin. In the parallel text to the one that says gehenna is a place of destruction of body and soul, Christ teaches that God has the authority to “kill, and then throw into gehenna”. What takes place in gehenna is not killing — it’s corruption. Thank you for your feedback, William. You and I appear to have a number of differences in our understanding. The key one seems to be in our perception of the “death” that is the wages of sin. You have a minimizing definition of this, which leads me to think that you disagree with the distinction theologians often make between physical and spiritual death. At least, if you accept that distinction you restrict the wages of sin to “physical death.” You suggest that this death is what we experience as the end of life, and that, given enough time that death results in corruption. On that definition, in Jesus’ physical death, he experienced completely the penalty for sin. Since he had no sin, he did this in our stead. In a text like Ephesians 2, I see reference to “spiritual death.” Paul tells the Ephesians (and us) that although we are physically alive, we are spiritually dead right now. We are “dead in sin.” Just as physical death leads to corruption, so does spiritual death. Most importantly, it alienates us from God, making us his enemies. I believe that the biblical descriptions of the salvation which Jesus accomplished for us by his death focus much more extensively on delivering us from spiritual death and its consequences, than on physical resurrection. I don’t minimize the importance of that bodily resurrection, but I don’t see it as the primary blessing of salvation. Consequently, when I contemplate Jesus’ death for me, I think of his experiencing not just bodily death, which Paul says is actually a better state than life in our present sinful condition, but more particularly the alienation from the Father and the experience of God’s wrath against sin. “Second death,” the final state of the wicked, is therefore, in my understanding, not simply a repetition of the first physical death. It is abandonment to the full depravation of spiritual death, which God’s grace prevents from occurring in the case of every human being who is physically alive, even in the case of unregenerate. Though they are not spiritually alive, they are graciously protected from the immediate outpouring of God’s wrath. But that grace is something God only gives people in this period of our first life. In the second death, that protection is no longer provided, and so people not only die again physically with the pursuant corruption of their bodies, they are completely abandoned to the devastating effects of spiritual death, and the wrath of God finally consumes them. Unlike the present time, when people are physically alive but spiritually dead, I think that it is the unmitigated effect of spiritual death which will bring about the final destruction of people’s being. It may well be that it is the judicial abandonment to sin and its effects which brings about the second death. The time comes when God no longer sustains people’s physical lives, and his just wrath consumes them. Romans 1 speaks of God now abandoning some people to their sin, but this is only in particular limited areas. It is a terrible judgment, but it is not complete, and it does not put them completely beyond God’s grace (“common grace”) or the total destruction of the second death would occur immediately, and there would be no resurrection. As to Jesus’ experience in between his death and his resurrection, I don’t recall, are you a physicalist? If so, your question makes perfectly good sense to me. Otherwise, I’ll need you to explain your point to me. I am a substance dualist, and I consider the incarnation and the death of the incarnate Word to be one of the key counter indicators to monism. Jesus was clearly of dual substance. Having existed forever before his becoming a man, Jesus was clearly more than just a physical human being. But, if we are purely physical, then Jesus was a one of a kind human being, and this is contrary to the biblical depiction of his being human just like us. On the other hand, if the Word became solely bodily, in the incarnation, then his death would have to entail a dissolution of the incarnation momentarily, since the eternal Word was indestructible. For the Word to have died in the way humans would die if they were solely physical would entail a complete cessation of being. That would be annihilation all right, but it is impossible that the Trinity should have become two-personed, while they waited for the Son to be raised back to life. Bottom line, I think that Jesus suffered physical death, as we all will, and that this was a consequence of his identification with sinners. But, more importantly, he experienced the alienation from the Father which is also a universal human experience. What he did on the cross satisfied the demands of God’s justice, and all who die with him are raised bodily, in a resurrection of which he was the firstfruits. But even before our death, our union with Christ gives us God’s life, reconciles us with God, and guarantees that at Christ’s return we will be transformed completely into the human being for which God created the human race, but which only those in Christ will realize. If I haven’t fully addressed your questions, William, please get back to me.